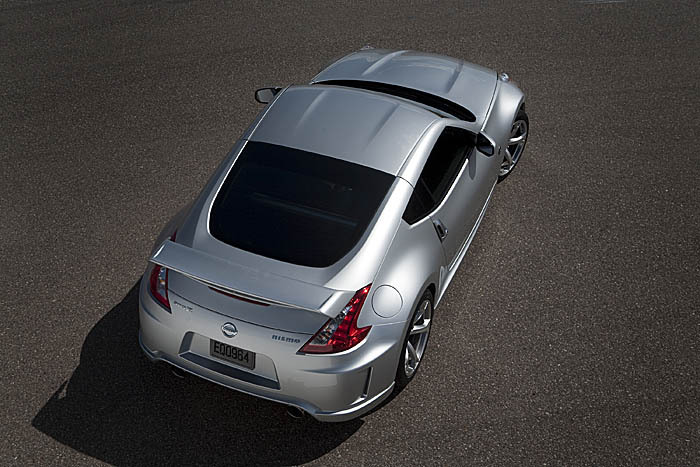 The Nissan 370Z really needs no introduction. Selected as our pick for our overall best car of 2009, the new Z represents a phenomenal package that any motoring enthusiast can appreciate. But wait. Could Nissan really take things to yet another level with variants of this FM platform? Would the successful formula that is the Z34 be diluted in any way by offering something for the left and right ends of the spectrum? Frankly, we believe this is the way the Z should come from the factory, Nismo or not. Sure, it has a strong “boy racer” influence in its looks, but you really shouldn’t drive a Z if you don’t understand concepts such as throttle-induced oversteer, opposite lock and trail braking. To not drive this car HARD is a complete and utter injustice. The interior is a different story. You won’t find anything particularly special. You get a very basic stereo system and not much more. Even the seats are the same as those found in the regular Z, albeit covered in different fabric and “Nismo” sewn into the backrest for good measure. As we’ll discuss in a bit, the Nismo Z needs a different cockpit environment. The handling characteristics of this vehicle require better shoulder and thigh bolstering and firmer seat cushioning to deal with the stiff suspension settings – our rear ends felt as if it was bottoming out. These niggles aside, the steering wheel position is excellent. Deep footwells also allow the drive to sit comfortable close to the steering wheel while still maintaining enough leg stretch. Now that you’re inside, what’s next? Push the keyless start button and bring the VQ37VHR engine to a roar. Slipping into first gear is more notchy and mechanical than we’d like. It’s just not as buttery a transmission you’d find inside a Honda. You’re forced to muscle gear shifts a bit and during very spirited driving, missed gears shifts are definitely a possibility. You won’t, however, find any fault with the SynchroRev Match system. It makes any driver a rock start behind the wheel, the ECU automatically blipping the throttle between every downshift. Heel-and-toe downshifting is an art form that takes much practice to master, but the Nissan system eliminates any need for it. We could call it cheating, but it works so well we can’t say anything to detract from it. The power output, on the other hand, is strong from idle to redline. The VQ simply does not quit in laying down power to the ground. The VQ in the Nismo has a slightly higher rated horsepower rating than the standard Z but this is offset by the added weight of the body kit. No matter. This car is fun to drive. Stoplight to stoplight drag races are disposed of with ease. Is it any wonder that the VQ38DETT found in the GT-R is based on this engine? Absolutely fabulous. Handling is pure bliss on the Nismo Z. By combining the gummy Bridestone tires, a limited slip diff and properly stiff suspension settings, this rocket holds its line and then some on smooth roads. When the road turns a bit rough, however, you truly realize just how stiff the suspension is. With much more aggressive compression / rebound settings and a very stiff spring, the Nismo Z WILL toss you around when traveling over rough, urban streets. And as mentioned before, better seating accommodations would have come in very handy in this driving situation. 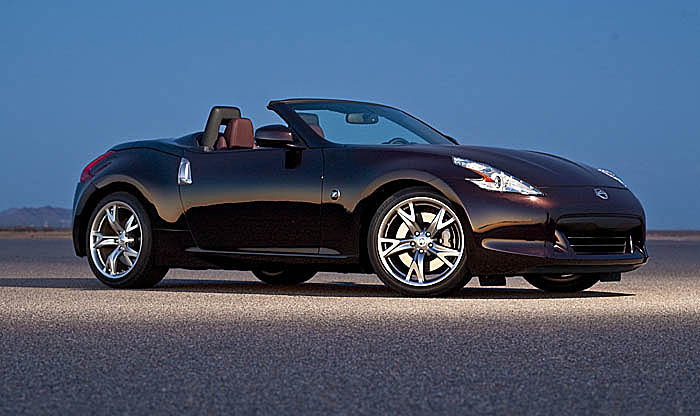 Indeed, if the Nismo 370Z is the tattooed brother, then the Roadster is the pinstripe wearing sibling. The moniker alone implies this car is meant for grand touring. It’s for open top motoring in the country side, with the wind blowing through your hair with an unrushed destination in mind. The fabric convertible top opens and closes in about 25 seconds each way. The operation is a choreography in moving parts, the top and hard tonneau cover adjusting, opening and closing with a degree of precision. Although the action is very smooth – save for the big thunk of the tonneau cover closing or the top sealing itself over the same over when the top is up – we wished it would work a little faster. 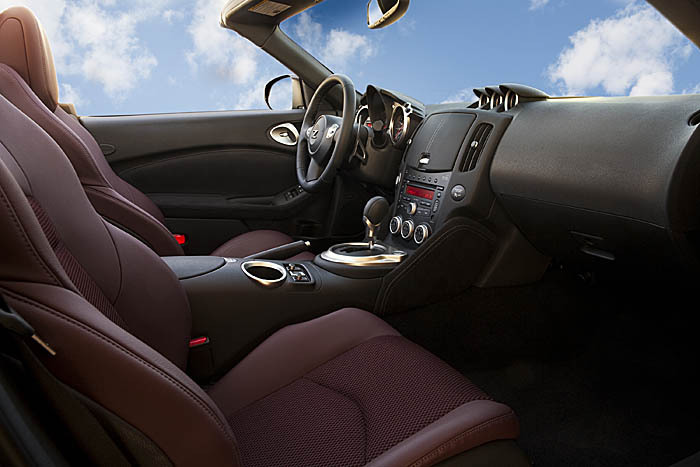 Climb inside and you’ll find familiar territory – interior accroutrements are the same as those you find in the coupe. Firing up the engine and flicking the paddles elicits nearly the same level of acceleration found in the Coupe. Throttle response is excellent, thanks to the throttle-by-wire system. Downshifts are fairly smooth courtesy of rev matching on the down cycle, but when engaging 1st from 2nd under aggressive driving, there is a noticeable amount of shudder and engine braking. We don’t see this as a problem for 99% of prospective Roadster buyers out there as we suspect they are more than happy to let the ECU figure out the downshifts in fully automatic mode. We just can’t see the same owners downshifting with aggressive abandon as they enter a 1st gear corner “hot” and punch it at the apex to generate maximum corner exit speed. Unlike its sister car under the Infiniti brand – which we would describe as “noodly” over railroad tracks and uneven terrain – the Roadster was firm and displayed none of the cowl shake and noise we’ve noticed in other open top variants. Taking the car to limits of adhesion presented no problems for the Roadster and we were impressed at how hard it would bite the pavement. Tail-out maneuvers were never a surprise, as it was very progressive and didn’t snap out the rear in unpredictable fashion. With the addition of the Nismo and Roadster models, Nissan has created a powerful trio of sports car options. With a truly ready-to-race Nismo Z, the “civilized” Roadster and the do-everything-well Coupe variant, the 370Z line is a powerful offering like no other on the market today. We can’t think of a common platform line up from any other manufacturer that offers the same level of performance, value and ownership experience that the 370Z brings to the table. It’s truly worth your purchase consideration if you care for a car that inspires you as a driver.